Gold stimulates collagen and elastin production activating regeneration and speeding cellular processes. Epidermal Growth Factor (EGF) is the human Epidermal Growth Factor produced by bio engineering technology. EGF is one of the most important growth factors in the human body. It can accelerate the growth of the epidermal cells - cellula nervosa. h-EGF is an important ingredient in cosmetics for anti-wrinkles and anti-aging. Snail mucin or snail slime is rich in hyaluronic acid. It is a complex mixture of proteoglycans, glycosaminoglycans, glycoprotein enzymes, hyaluronic acid, copper peptides, antimicrobial peptides and trace elements including copper, zinc, and iron. It gives moisture and helps to remove dead skin cells and firm your skin. Apply the sheet mask onto the face, then start massaging the face in circular motion with the 1-3 MHz Ultrasound Massager + Red/Blue light combo (or just Red) IPL Photon Light for 10-15 minutes. Either pat the remaining gel into your face or rinse the remaining mask with warm water and apply your own moisturizer. The Beauty Face Mask gives your skin a youthful, ultra smooth, glowing look. The main benefit of gold that is used in skin care products is the ability of the gold to increase the radiance that can be seen through the skin. The Colloidal Gold within the Beauty Face Mask is dissolved into tiny particles that are suspended within the collagen gel mask so they can be easily absorbed by the skin. 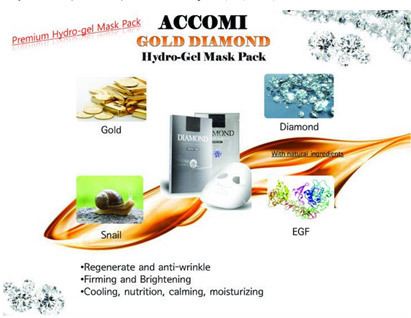 Then, in combination with the other 3 main ingredients, and the ultrasound waves at 2Mhz or more, maximum absorption of the diamond, gold, EGF and hyaluronic acid into the skin is achieved. The Beauty Face Mask, uses only medical grade ingredients that help eliminate toxic build-up, boost as well retain collagen levels, and provide EGF to repair cells and increase the appearance of healthy looking skin. Although expensive, it has been proven that there have been special effects on the skin from products made of gold, while EGF and hyaluronic acid are quickly becoming de rigueur for skin repair and rejuvenation. Body Ecology author Donna Gates in her book The Baby Boomer Diet states: "Aging of cells caused by accmulation of toxins and nutritional deficiencies" and we agree completely with this hypotheseis based on our own clinical findings which, when targeting toxin elimination and collagen and elastin stimulation and replacement, skin rejuvenation has out-reached our predictions every time when using this mask with the 1-2Mhz Photon Ultrasound Massager. email scalardayspa@gmail.com if you have a special request.